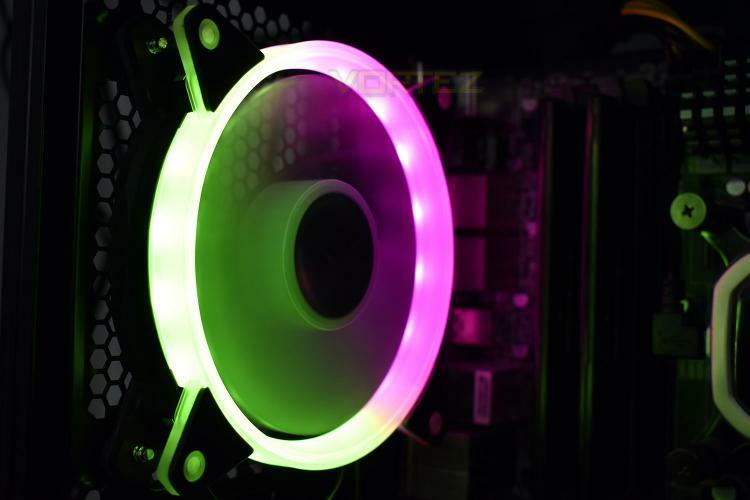 It goes without saying that the RGB craze has happened and is still happening, with no end in sight; making use of that, Akasa have introduced RGB lighting to their case fan range. Today we look at the Akasa Vegas AR7 RGB, a 120mm case fan with several addressable RGB LEDs built into the frame. RGB lighting is supported by Gigabyte’s RGB Fusion, ASUS Aura Sync, MSI Mystic Light Sync and ASRock RGB LED. The fan also features anti-vibration mounting for quiet operation. Due to the 3-pin fan connection, the speed is fixed at 1500 RPM which will ensure constant airflow if that’s something you require. Pricing is also reasonable, costing a little over £15 in the UK and leaving change from $20 in the US. Let’s see how it performs and how the RGB lighting looks in our system.